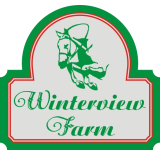 Winterview Farm is all the rage on social media! I found you there. I found Winterview Farm with an Internet Search Engine. I saw a printed ad for Winterview Farm. Somebody cool told me about Winterview Farm! I found Winterview Farm some other way.